View here all the air hoses that you can use to direct compressed air from a compressor to a location where you need it. To connect the compressor to the air tank, dryer, oil/water distributor or pressure regulator, aluminium or PVC tubes / hoses are often used. Branch pipes are made from this main line to various components in the compressed air system. A branch can be a spiral tube and can be used to operate an air gun. Or an air hose reel that supplies a tire pump with compressed air. A third branch could be a pneumatic system with several actuators that perform different actions. Compressed air hoses are widely used to supply hand tools with compressed air. For example, an air ratchet can be connected to it. Often the material of these hoses is polyurethane, polyamide or PVC. 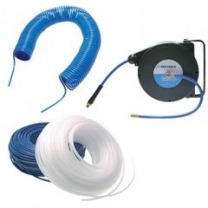 These hoses are often easy to store, such as spiral hoses or air reels. The pneumatic hose refers to the hoses that connect actuators in a pneumatic system. Pneumatic hoses are usually thinner, flexible hoses without inserts that are used to connect an actuator, such as a pneumatic cylinder, to a solenoid valve. Frequently used materials for this are polyurethane (PU), polyethylene (PE) or nylon (PA), where PU is the standard. Special thick-walled hoses are used in situations where vacuum is used. Sometimes these hoses have an insert. This means that a core of metal, plastic or other kind of strong material is arranged between the different layers of the hose. Without this thick wall or insert, the hose could be sucked flat through the vacuum. The insert therefore ensures that the vacuum hose, of which the material is often PVC, retains its round shape. More information about air hoses and all other types of hoses, you can find in the Tameson article on hoses.